The Simpsons: Bartman Meets Radioactive Man is a video game that was released in December 1992 for the Nintendo Entertainment System and in 1993 for the Sega Game Gear. Bart Simpson is reading the latest Radioactive Man comic but Radioactive Man is not featured in it. When he is at the last page, Radioactive Man's sidekick Fallout Boy appears. He tells Bart he is the only one who can save Radioactive Man who has been sent to the Limbo Zone, a mysterious prison that revolves around a black hole. 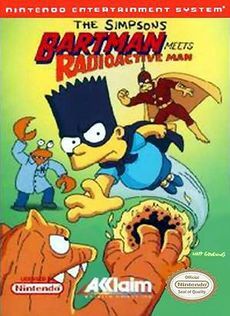 Bart turns into Bartman and he has to fight three super villains to collect Radioactive Man's lost powers before facing the mastermind Brain-O the Magnificent. Players control Bartman through 2D side-scrolling platform levels. He needs to defeat enemies, collect goodies, and be careful not to fall into one of the deadly traps on his way. Bartman can punch and kick, and collect lightning icons to shoot small bolts. Most of the level sequences require precise timing and pixel-perfect jumping precision. Bartman has five life points that are restored by collecting radioactive signs. Wikisimpsons has a collection of images related to The Simpsons: Bartman Meets Radioactive Man. Modified on February 22, 2015, at 05:41.